A demolition crew made quick work of removing the old elevator building at Dell Rapids Coop Grain. The near 100-year-old structure was dismantled by Knodel Contractors and hauled to a local landfill. 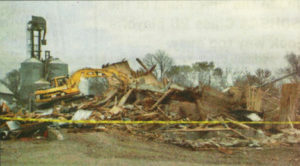 The firm’s Caterpillar claw tractor is pictured crawling over the lumber and debris after the building had fallen. A century old Dell Rapids landmark came tumbling down last weekend. The old Dell Rapids Coop Grain Elevator and roller mill, which was located next to the railroad tracks on LaDelle Avenue, was systematically dismantled and hauled away. Knodel Contractors, a Freeman firm that specializes in demolition, handled the project. A skilled operator of Caterpillar claw tractor did most of the demolition work. The Knodel crew kept chipping away at the exterior of the elevator and finally the entire main structure toppled late Friday afternoon. Providing the most resistance were the huge timber beams, 16” x16” in width, that anchored the base of the old building. The exact construction date of the old elevator still remains a mystery. Dells old timers have figured the building was about 100 years old, built near the turn of the 20th century. Some of the grain marketing articles, including the old scale, have been removed and preserved in the Dell Rapids Museum on Main Street. The newly constructed steel roller feed mill, built just north of the old structure, is fully operational, according to Lee.